bakerdays Valentine's Letterbox Gift Cake Review and GIVEAWAY! 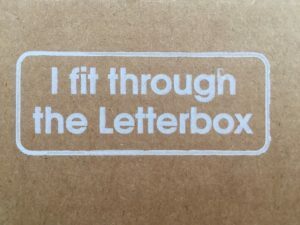 I was actually at home when it was delivered but my postman pushed it through the letterbox. It didn’t get damaged, as it’s so well packaged, and it was ready to eat! 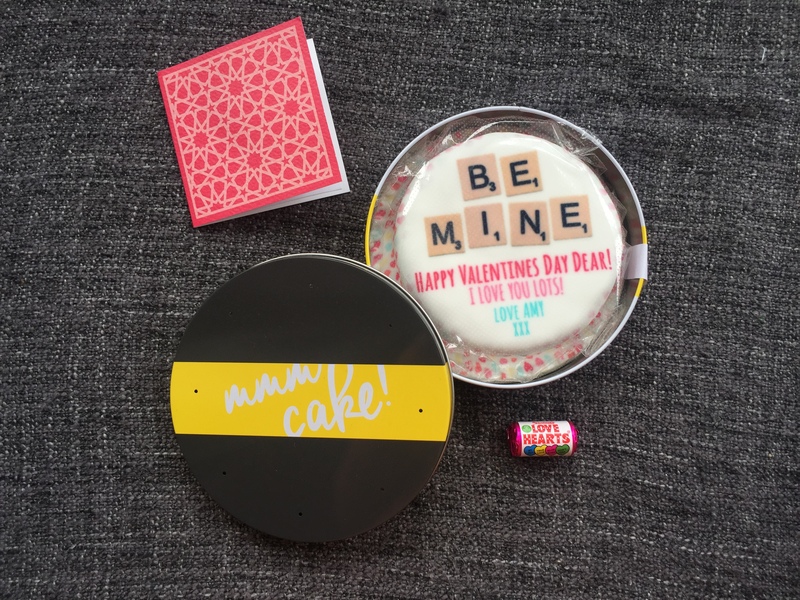 The cake comes in a tin box with a card and a packet of Love Heart sweets! How cute! 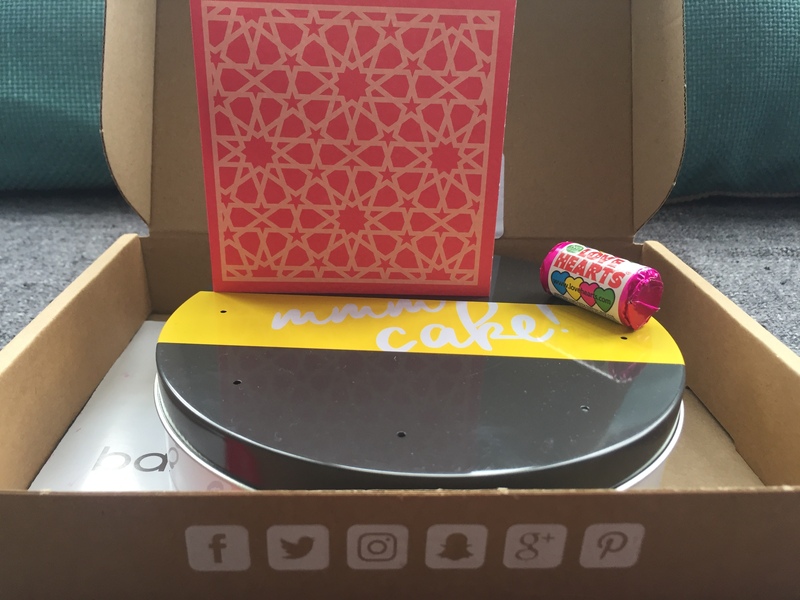 The ‘mmm cake’ box has the 5″ Fruit cake in, wrapped in plastic wrapping for freshness until you are ready to open it. As I’d got this for my husband I opened it all up and repackaged it so he could open it! They have cleverly thought about how to get the cake of out the snug box. There is a paper lever that is stuck under the cake. When you pull the lever it lifts the cake slightly so you are able to pull it out. They have thought of everything! The cake I picked was a Valentine’s scrabble piece “Be Mine” cake with a personalised message. You can customise most things on these cakes and have anything you like. We are big fruit cake fans in our house, so we decided to go for fruit cake. I’m glad we did too! It was DELICIOUS! Although it is only a 5″ cake you can easily get 8 portions out of the cake if you want too. Okay, so maybe 4 if you want a generous sized piece. We are definitely wanting a bigger piece! I am a good baker but there is no chance I’d be able to make a cake like this easily and get it to be a surprise for my husband! bakerdays are the perfect gift for Valentine’s Day. However, you do have to get a bit lovey dovey with it… There is still time to get it ordered in time for Valentine’s Day. Go, go, go! So, do you like the sound of a bakerdays letterbox cake after reading my review? Well now is your chance to WIN one! bakerdays are kindly offering one of my readers a 5″ Letterbox Gift Cake with a design of your choice. How amazing does that sound?! Which cake would you choose if you won? What’s your favourite cake? Fruit, sponge, chocolate? Let me know in the comments below. Fingers crossed for you all and good luck! You can find bakerdays on Facebook and bakerdays on Twitter. The competition is open to all UK and Northern Ireland residents only. bakerdays will post the cake via Royal Mail First Class Post. By entering you agree that your email address will be passed onto bakerdays for them to contact you to arrange the design for the prize. All responsibility for the prize is with bakerdays. The competition will end of 10th February 2017. Good luck! I would love to be able to send my son one of these cakes for his Birthday! 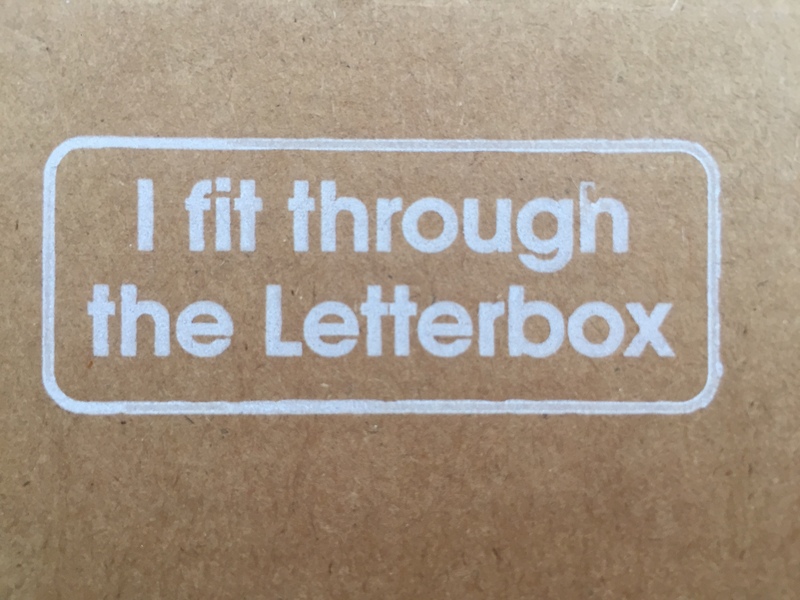 What a great idea that it fits through the letterbox! I love this idea 💕 If I was lucky enough to win I’d have to choose chocolate .🍫 Yum! 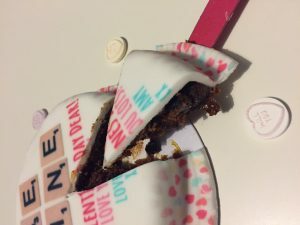 Lovely competition – thank you. These cakes look great! 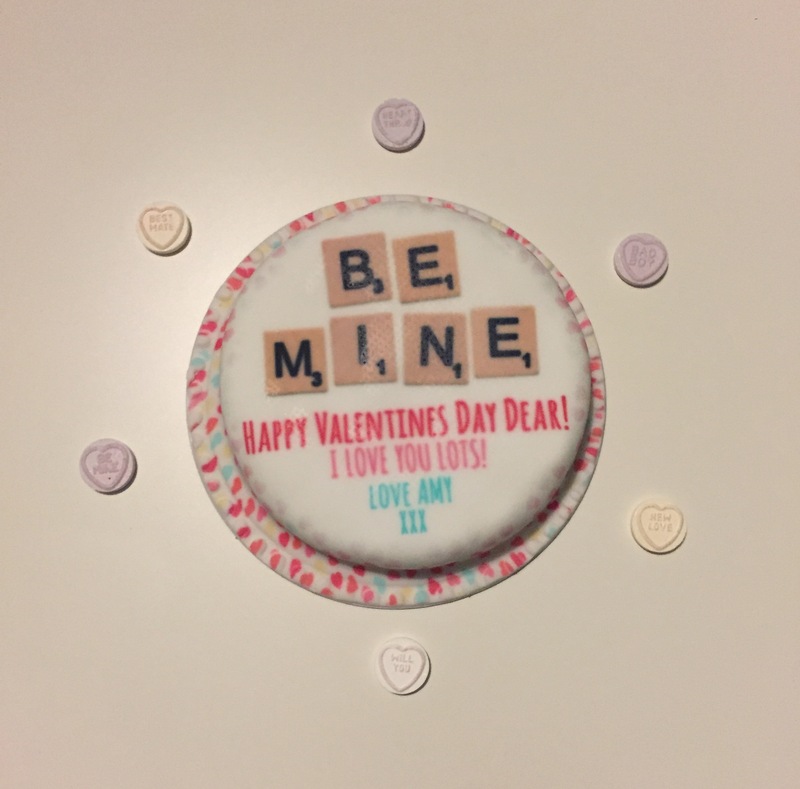 What a great Valentines’ idea–or any occasion idea, for that matter! Thanks for the tasty giveaway! I’ve tried one of these cakes. They are really nice, and I’d love the excuse to have another. Thanks for the giveaway. I would love to try their red velvet cake . The choice of designs on Baker Days website is brilliant. Cake that comes through your letterbox… Whatever will they think of next?! This is a genius idea and perfect for sending little things to family who don’t live close by! I would get a chocolate cake for my niece.